It’s that time of year, Spring has sprung, the bird is on the wing, and so are all the flying pests! Those of you with itchy horses are getting ready to protect your precious friends from suffering, and I am here to give you some ideas how to succeed in your mission. Essential oils can be really helpful in combating itchiness, not just to keep pests away but also to help strengthen the skin and increase immunity. However, as with everything, an holistic approach works best and it is important to look at how you can reduce external stressors in your horse’s environment if you want to see a good result. The skin is the largest organ of the body and the safest place for the body to rid itself of toxins or any other stress and is a good indicator of general wellness, or the first warning of an imbalance. Skin sensitivity, whatever the trigger, suggests that all is not well within the horse’s system and first of all I try to balance and strengthen the whole animal; it is useless simply applying soothing creams if the underlying cause has not been addressed. When treating an animal for any condition it is important to look at all the factors that contribute to the problem. I have found that reducing stress and understanding the natural needs of a species is crucial if you want your animal to fully heal. Otherwise you are using essential oils to reduce symptoms, without addressing the underlying problem. This is the basis of my animal wellness system, Animal PsychAromatica. What type of ‘itch’ have you got? Excess hormones – mares that cycle constantly or very strongly, and stallions or geldings with high libido often turn to itching. The first step for this type is to strengthen their Liver and balance their hormones. The oils I commonly use are: rose (Rosa Damascena), geranium (Pelargonium graveolens), cedarwood Atlas (Cedrus atlantica), angelica root ( Angelica archangelica), german chamomile (Chamomila recutita) and occasionally clary sage (Salvia sclarea) or jasmine (Jasminum grandiflora). The Geneticist – These are usually Arabian or native ponies, and they have a true allergy to the cullicoides midge. So you must keep them away from this pest (no-see-ums). Protection is the key for this type, I coat their manes, tails and bellies with a clay based lotion containing neem oil and essential oil of Greater Mugwort (Artemesia arborescens), (not common mugwort (Artemisia vulgaris), which is not safe to use as an essential oil). Great Mugwort is anti-histamine, anti-inflammatory and cooling, offering instant relief from all histaminic reactions. Neem oil repels flies and soothes skin. If necessary use a breathable sweet itch rug. Whatever the underlying factors, I have a threefold approach to itchy skin: relieve, protect, repair. Relieve: first of all we must relieve the discomfort that is causing the itching by removing stressors if possible, then strengthen the immune system and all the meridians with essential oils. 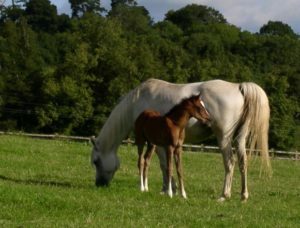 Protect: then protect the skin from further aggravation and give it time to recover, use fly repellents, (I use a natural, neem-based spray of my own that I make especially for the horse I am treating, using the oils the horse selects), a breathable fly rug, or make a mud wallow for your horse to roll in, as it would in the wild (or a combination of all three). You can simulate the mud puddle by wetting your horse down then letting it roll in a dust bowl, this gives a nice cake of dirt to keep the bugs off the skin. I might also make a clay-based lotion with the essential oils the horse selected to soothe and protect mane, tail and other areas that are severely rubbed. Repair: it can take a full year’s cycle to see a complete cessation to the itching, I continue to offer essential oils occasionally through this time to help build healthy skin and a strong immune system, especially in Spring before the itching starts. Spring is a good time to do a herbal de-tox as well. Feed herbs such as calendula, seaweed and rosehip and flax or hemp seed oil to help strengthen the skin and immune system. Witch hazel hydrolat is one of the universe’s most soothing, reparative and cooling products and can be used as a spray for instant relief and to help skin repair or mixed with white clay (Do not use ‘shop bought’ witch hazel as it contains high levels of alcohol which will dry the skin and sting). Mocha was lead mare at my friend Nathalie’s ranch in Israel, and keeps us all honest with her wise gaze. Mocha has a very strong maternal instinct, adopting any orphaned foal that is brought to her, even producing milk on demand. Nathalie bought Mocha at the end of winter, twelve years ago, and had no idea that come summer her beautiful grey mare would be bald! Every summer was a nightmare, trying to control Mocha’s itching. In the end Nathalie even resorted to steroid injections to stop her suffering. Great mugwort, anti-histamine and anti-inflammatory. Each oil was individually diluted in 5 mls of sunflower oil. I also made a lotion containing the selected essential oils, bentonite clay, neem oil and geranium hydrosol, instructing Nathalie to start applying it as soon as Mocha showed any sign of itching. We kept applying the clay through the summer, and offered her a changing array of oils, geranium and great mugwort being the favourites. By the end of that summer, with diligent application of the clay, Mocha still had a mane; she had rubbed a little on days when the heat and humidity soared but nothing compared to previous years. She was also round, happy and had fully grown into her role of wise-woman. Through Winter she needed no support from oils and as the next Spring came around she was given a ‘boost’ using angelica root and yarrow. On days where it was uncomfortably hot the clay lotion was applied. Mocha would catch Nathalie’s attention on days when she needed the lotion, staring at her through the fence. If Nathalie didn’t notice Mocha staring she would gently rub her head against the fence. The pictures below tell the story. Do not shampoo horses that itch, shampooing removes natural oils and dries skin, cold hosing without shampoo is recommended. Do not use citronella or other skin irritating essential oils. Provide free choice mineral/salts and give electrolytes on days when they sweat. This is so helpful. I have a 4 yo gelding who gets small itchy welts only on face and shoulders. Just had a blood test done to determine allergens. Will try to determine right oils. Do you do consults? Your book was recommended to me when I got interested in Aromatherapy for horses , it’s become my “bible” of equine remedies. Your clay lotion for sweet itch works wonders on a quarter gelding I’m trying to rehabilitate at the moment. He’s also got sarcoids as well as arthritis – also treated with your recipes. I would like to consult with you about my arabian mare , 6 years old , severe sidebone (diagnosed in 2015) and now in foal for the first time. Also, my friend and I were thinking of doing a course on equine aromatherapy with you in Portugal but this summer we both have a tight schedule are there winter courses or in the spring available? Hi Melanie, I so love to hear that my book is helping you help horses 🙂 For a consultation, if you could email me history and photo of your mare I can take a look and see what I can do, and we can take it from there. Price is €55. If you and your friend would like to come to Portugal we can arrange dates and a syllabus to suit you any time that works for you. Winter is lovely in Portugal, and Spring is divine….